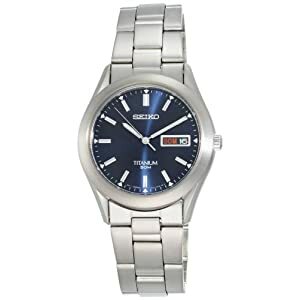 Silver tones and a blue dial make a striking contrast on this watch. The bezel and bracelet are titanium (a super-lightweight material). The day and date are shown in the standard 3 position. This beautiful watch can be worn at home or to the office, with khakis or a suit. Japanese quartz movement makes sure the time is always right. Water resistant to 50 meters (165 feet), it's safe to get wet. It's thin and light, so it never gets uncomfortable. He may never want to take it off!